Twine is a simple device that can sense your world and text or tweet you about it. For every kid who tinkered with electronics or learned how to program on an old computer, creating a gadget that someday everyone would want to own was merely a dream. But times have changed, and the rise of the small inventor has come. Case in point: two recent grads of the MIT Media Lab, John Kestner and David Carr, had an idea for a handheld device packed with sensors that could email, text or tweet you if your basement was flooding, for example. They nailed down the concept, built a prototype and dubbed it Twine, formed a business called Supermechanical and launched a campaign on Kickstarter. Their goal was simply to raise $35,000 to make 200 or so devices for enthusiasts. But Twine scratched an itch few could have known existed, and within a few days it was clear that they were destined to be the poster children of crowd-supported fundraising for hardware gadgets. Nearly 4,000 backers came out of the woodwork to raise over half a million dollars, which meant Supermechanical would have to make 30 times more than they expected. And kind of like Dexter transforming into Ace (Space Ace, anyone? ), the Supermechanical team had to go big and fast, which meant wading through manufacturing problems (i.e., scaling and quality assurance) while balancing hardware revisions and supply chain issues. But Supermechanical has proven they’ve got the skills to make it happen: the team has announced that Twine will be shipping at the end of May for $99 each. Twine is a 2.5″ square of blue acrylic that looks like a bar of expensive soap. It contains a board with a bunch of sensors with inputs for external sensors. It communicates by Wi-Fi to a straightforward web app that allows users to define rules and set how to receive notifications. A simple way to look at Twines is to think of them as portable alarm detectors and the web app is the way to set the alarms. That’s it in concept, but the beauty of Twine is in the possibilities. For every gardener and plant lover who worries about the frost, meaning habitually checking the weather during colder months, a Twine could be placed in the garage and send notifications when the internal thermometer gets to within a few degrees of freezing. If you’re drying your clothes and want to avoid wrinkles, you could set a rule to tweet you when Twine’s accelerometer indicates the dryer is done. Other components like a moisture sensor can help you check for water leaks and the magnetic switch can be used with a magnet to basically secure anything. Finally, breakout boards allow users to expand upon Twine and plug in anything they want without having to solder things together. Altogether, Twine connects users with their physical environments via the digital world in a simple, elegant way. Now, it’s true that household appliances are getting smarter, especially with televisions leading the way. It seems like manufacturers see those nice flat surfaces on refrigerators, dishwashers and washer/dryers and think, “Let’s slap a touchscreen on it and call them smart devices!” There’s literally no turning back now from how connected homes are about to become (and you should definitely get your hands on the 1984 movie Electric Dreams to see how it’s all going to go bad). But the rush to connect has created a whole other sets of problems, such as too many or too few features, different or confusing interfaces, or features that can’t be turned off. Call it a first-world problem, if you will, but running a connected home with too many of these devices can become technologically fatiguing. 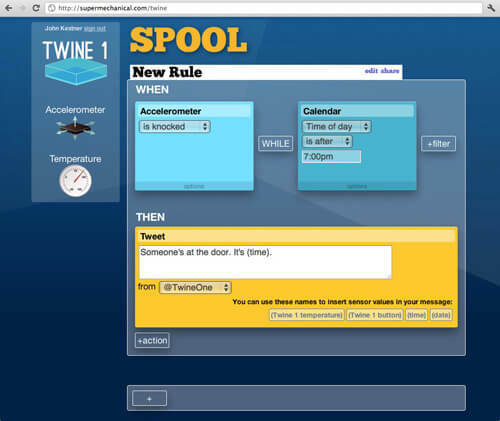 A very straightforward and sleek web app allows users to sets up rules for Twine, including notifications. The beauty of Twine is the degree of control users maintain over what information they receive. Twine lets you select what you want to know about using the web app and just filter out the rest. Because of its streamlined web interface, you never have to recall the flow of menu options or how to set up a timer for every device. The rule system is logical and intuitive. It’s portability means users are in control and they can use it whenever and however they want, something that brings a bit of balance back to those who tire of their tricked-out appliances overloading them with information about what’s going on inside of it. And this is just the first batch of Twines being made. The team reports on their blog that they’ve learned a lot and are in their fourth revision of their original design. Twines are only going to get better and Supermechanical’s experiences will be utilized in all the other projects they’ve cooked up. All in all, Twine looks to become the de facto way to connect to your environment, and fortunately, Supermechanical now knows they aren’t the only ones geeked out by Twine’s coolness.